Most internally amplified vibration sensors require a constant current DC power source. Generally, the power supply contains an 18 to 30 volt source with a 2 to 10 mA constant current diode (CCD) (see Figure 1). If other powering schemes are used, consultation with the sensor manufacturer is recommended. A more thorough discussion of powering requirements follows. The sensor output is an AC signal proportional to the vibration applied. This AC signal is superimposed on a DC bias voltage also referred to as bias output voltage (BOV) or rest voltage. The DC component of the signal can be blocked out by a capacitor thereby leaving the AC output signal. Most vibration data collectors, monitors and sensor power units contain an internal blocking capacitor for AC coupling. The sensor manufacturer usually sets the bias voltage at half of the nominal supply voltage. The difference between the bias and cutoff voltages determines the voltage swing available at the output of the sensor. the output voltage swing determines the peak vibration amplitude range (see Figure 1). Thus an accelerometer with a sensitivity of 100 mV/g, and a peak output swing of 5 volts will have an amplitude range of 50 g peak. Some accelerometers may be able to achieve a larger voltage swing than the 5 volts normally assumed. Consult with your sensor manufacturer for details of the voltage swing permitted for the sensor under consideration. If a voltage source lower than 18 volts is used, the amplitude range will be lowered accordingly. Custom bias voltages are available for lower or higher voltage supply applications. Virtually all internally amplified vibration sensors require power supplies that are regulated by a CCD. The CCD limits the current supplied to the sensor. The use of unlimited power supply current will damage most internally amplified sensors. For this reason, most commercially available data collectors and vibration monitors have power supply circuits that include a CCD to regulate the power supplied to the sensor. The power supplied is almost always in the 2 to 10 mA range. Most battery power supplies contain a 2 mA CCD to ensure long battery life. Line powered supplies (where power consumption is not a concern) should contain 6 to 10 mA CCDs to drive long cables. For operation over 100°C, limit the current to less than 6 mA to reduce overheating of the accelerometer's internal amplifier. Common CCDs used are the JS500 Series (J507, J509) from Vishay Siliconix. The CCD should be placed in series with the voltage output of the supply while making sure that proper diode polarity is observed! 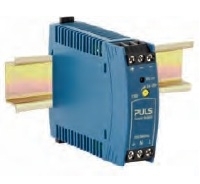 The CMCP515 Series Power Supplies have a 24 VDC Output and are DIN Rail mounted. They are recommended for use with the CMCP500 and CMCP420VT Series Transmitters and Monitors as well as -24 VDC Proximity Probe Systems. No de-rating or heat-sinking is required, and the output is short circuit protected. 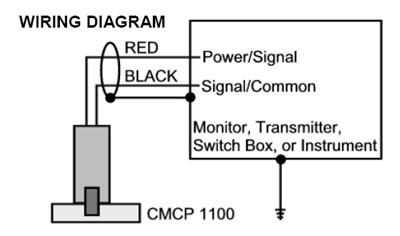 If redundant supplies are required the CMCP515-RDNT may be used.